Andrew is a Principal Lawyer in the personal injury team at our Cambridge office. He has over 12 years’ experience in personal injury and specialises in traumatic brain injury. Andrew delivers clear legal advice in a way that clients understand. He strives to obtain early rehabilitation and interim payments for his clients. He has dealt with a number of high value brain and spinal injury claims, including applications to the CICA and MIB, and runs cases with great skill and care. He is a tough negotiator who goes above and beyond expectations to provide exceptional client care and demonstrates outstanding attention to detail. One of Andrew’s notable cases includes a serious road traffic accident in which several people died. Our client suffered a serious brain injury and needed life-long care. The case settled for £1.8m together with periodical payments of £75k. 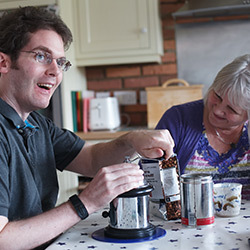 Andrew is a member of APIL and is a Trustee and Company Secretary of Headway Hertfordshire. He is also ranked as a recommended lawyer in the independent legal guide, Legal 500.